After years of delays and a dearth of information, the King Abdulaziz Center for World Culture (known as Ithra) in the Saudi Arabian eastern city of Dhahran is finally getting off the ground. 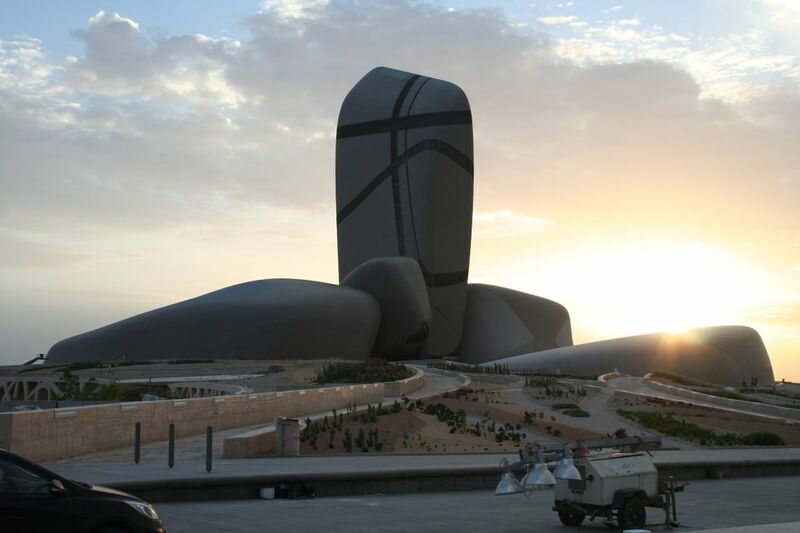 The long-awaited culture hub, which is funded by the Aramco oil conglomerate, should be fully open and operational by the summer. A spokesman for the centre tells us: “The centre is undergoing its soft opening phase after [it was] officially inaugurated by the Custodian of The Two Holy Mosques, King Salman bin Abdulaziz, on 1 December. We’re ramping up for full operations during the first half of this year.” The Art Newspaper understands that the cultural institution, designed by the Norwegian architects Snøhetta, cost around $400m to build. The centre will host touring exhibitions and houses a museum that incorporates four main galleries. These include the Funoon gallery which will “showcase the best of Saudi and Middle Eastern Modern and contemporary art”, a statement says (works to be shown are to be confirmed); this space is due to open in March. The Kunooz gallery will focus on Islamic design and heritage. A Knowledge Tower is another key component of Ithra. “It has many rooms that will host 2000 annual workshops in STEM subjects—science, technology, engineering, and mathematics—in addition to arts, the multimedia, and skill-building programs,” says the statement. The centre’s archives will underline the “human element” of Aramco’s approach and history. Ithra is also extending its global reach, co-organising the exhibition Ahmed Mater: Mecca Journeys at Brooklyn Museum in New York (until 2 April). The show includes Mater’s acclaimed series of photographs Desert of Pharan: Unofficial Histories Behind the Mass Expansion of Mecca. The Ithra website stresses that it is at the heart of the Saudi Kingdom’s mission to “continuously build positive relationships and position itself strategically in the global arena”. The Bridges initiative is a key part of Ithra’s international reach, underpinning the Culturunners initiative founded by Stephen Stapleton, the co-founder of Edge of Arabia. “Eighteen months ago, Culturunners was invited by Ithra to produce an unprecedented cultural exchange programme between Saudi Arabia and the United States. At that time, no one could have imagined the cultural and political transformations about to unfold in both countries,” says a Culturunners statement. The joint programme encompasses a raft of projects including an exhibition dedicated to Abdulnasser Gharem held at the Los Angeles County Museum of Art early last year. Saudi artists also undertook a ten-city US tour, taking in Houston and Los Angeles, as part of the Bridges scheme. “As for the Bridges Art programme, we will continue this year with an ambitious plan for a number of art exhibits around the world,” says the spokesman for Ithra. The Ithra launch follows Saudi Arabia's Crown Prince Mohammed bin Salman bin Abdulaziz Al Saud’s soft power initiative, the Misk Art Institute, which is the artistic arm of his philanthrophic Misk Foundation. The new institute aims to “become Saudi Arabia’s leading platform for grassroots cultural production, diplomacy and exchange”. The Crown Prince's sweeping reforms have included restricting the power of the country’s religious leaders, arresting members of the royal family and other leading Saudis on charges of corruption, and permitting women to drive.